With another move coming in the months ahead, I have been surveying my collection of stuff and contemplating the fate of books and models. 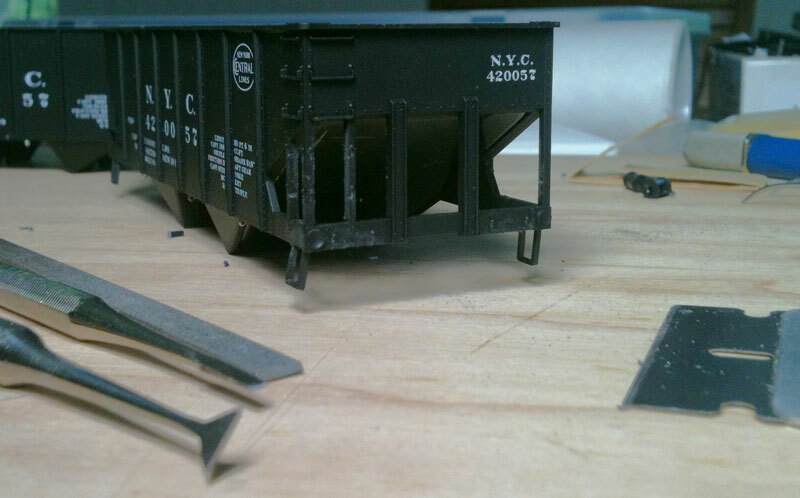 I have a number of post-WWII freight car kits that no longer capture my interest. I’ve pulled a few and thought it would be good to build these and put them on the Morgantown, WV railroad historical society layout when I return there for my daughter’s graduation late in May. So I started on some Accurail hoppers. I also found a couple of other Accurail hoppers that I started back in September. These are finished with as-built NYC Lines paint and lettering and fit my 1926 modeling era. New York Central as-built USRA hopper. I now have four Accurail hoppers underway, two for the post World War II era and two for 1926. In short order, all four of these hopper cars came to the same point in construction. Couplers and brake systems are installed, trucks are ready, and eyebolts have been installed for the brake line. There are some minor hardware differences. The two post-WWII cars have Kadee #5 couplers and the kit supplied brake system parts installed. 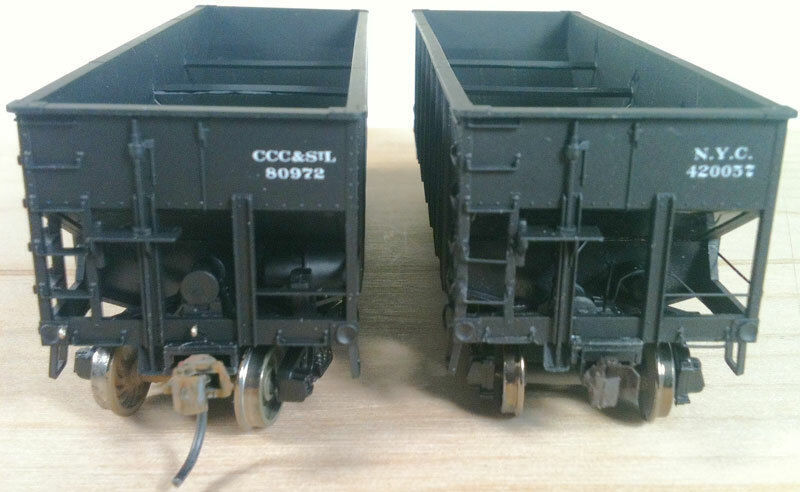 The two 1926 hoppers have Accurail Proto:HO couplers installed and the earlier KD brake systems. Here’s a view of the 1926 brake systems. All images on this post were taken with my iPhone and a little extra light from a shop lamp. I used a Tichy KC brake system part and carefully cut it behind the tank to create the KD components. They also make a KD brake system, but I did not have one on hand. The Tichy parts need some cleaning up to remove part lines. This is best done before splitting the original casting. I added the brake line to the back of the brake cylinder, but only bent it around towards the back of the air tank. It is not attached to the air tank but attached to the slope sheet support. I’m trying to keep this simple and not model what I can’t see. The strap over the air tank is some 1×3 styrene while the brake lever is from the Accurail parts. I cut down the brake cylinder mounting pedestal on the Accurail frame as I did not think this was used on the original cars. Alas, I was wrong, kind of. I found a builders image of a NYC Lines hopper and there is a pedestal for the cylinder, but it does not seem as tall as the part on the Accurail frame. Next time, I will probably leave this alone and use the Accurail supplied brake cylinder in order to ease construction. I only wish I could easily fabricate a K system air tank from the Accurail parts rather than using a nice Tichy set. The two post WWII cars will not get much more extra detail, but what do I do with the two 1926 cars? Do I slice off ladder rungs and replace with wire? I can hear someone say now that I should have just build a Tichy USRA hopper kit. Yes I could, but what do I letter it with? 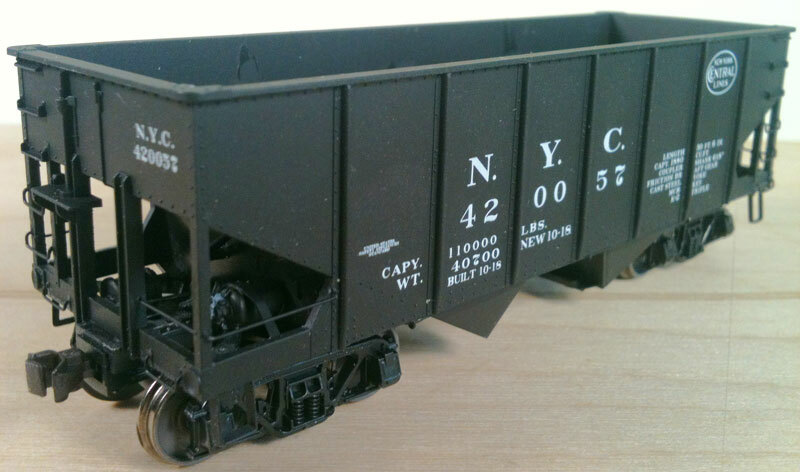 Few USRA hopper decals for this pre-Depression are available right now, and none I know of for the New York Central. This Accurail car has very crisp period-specific lettering, so I think I will follow a method a friend has done on some of his hoppers. The next step on the post-WWII cars is to attach the underframe, then glue bird shot into the open cavities to add some weight. Once that is dry, I’ll add the brake lines through the eyebolts. I’d like to add weight to all four hoppers at once, so there will be a pause in the post-WWII car construction until the 1926 cars are ready for that step. I timed my work to see how quickly I could remove the cast on detail. The process took about thirty minutes for one car and transformed it into this. I did not remove all ladder grabs, just those that can be seen easily on the bottom half of the car. I’ve tried to keep the mounting bolt heads in place. I’ve also made dimples in preparation for drilling holes. The tools are seen here as well. On the left are two dental chisels, one wide blade and a narrow blade, and a jewelers file. On the right is a trusty, new, single-edge razor blade, which slices plastic detail like butter. Not much force is needed with a new blade, just a little nudge or some rocking motion and the slice is done. The chisels are used to clean up in tighter spots. The wide chisel is used more as a scraper as it is pulled across the face of the plastic to remove and smooth. The narrow chisel is great around the poling pockets and other areas. This can be tedious model work, especially if you are not used to the techniques or if you have not done any fine work for a while. I took a break and walked my dogs for an hour or so to clear my head. I took my time and installed grab irons on one hopper. Again, I’m using a method a friend has done to several hoppers on his layout. Actually, he only replaces any grabs that hang in space, like the ladder grabs. Here’s his BR&P hopper as comparison. I did not remove the top three ladder grabs from the Accurail model. So far I like how this is turning out. Once you get rolling on the removal, it goes pretty well. The corner post attachment is tricky and I used a method mentioned on the Steam Era Freight Car (STMFC) YahooGroup. The holes on the corner post do not go all the way though, only part of the way. The leg of the grab that attaches to the corner post is trimmed short and hangs from the partial hole. 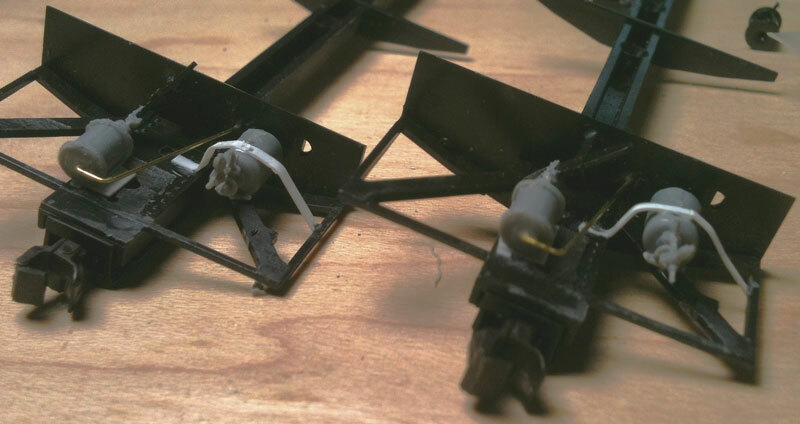 Thin super glue (CA) is carefully applied with a piece of small diameter wire to affix the new grab irons into place. I wrapped up installing all of the grab irons and the brake line on both 1926 era hoppers in about an hour after dinner. I also added the brake rod along the centersill and the Accurail parts for the door hardware. Here’s what it looks like with the trucks mounted. I wanted to add extra weight before adding more of the details, but I cannot find my stash. It’s here somewhere, still packed away after the last move. One sill step was replaced as it was crushed while adding other detail. I also meant to paint the brake system details before installing the underframe as it is easier to hit all the nooks with a brush at that point. Alas…..I forgot. The above image shows the closer coupling distance that comes with use of the Accurail Proto:HO couplers. These were designed to have the knuckle face at a more prototypic distance from the end sill. These are my standard coupler for 1926 freight cars. At this stage, a few details still need to be installed, possibly after the extra weight is added. Carmer uncoupling levers and air hoses will be added late in the build process. Next will be the installation of the interior cross braces. These two images were also taken with the iPhone, but the models were outside. I was surprised the lighting was not as good as what I cobbled together for the other images. Each of these photos needed some contrast/brightness adjustment, while the second image needed some fill light adjustment – hence the hazy feel to the image. Another lesson learned! I built a Tichy USRA hopper kit years ago and always liked the interior bracing included in the kit. 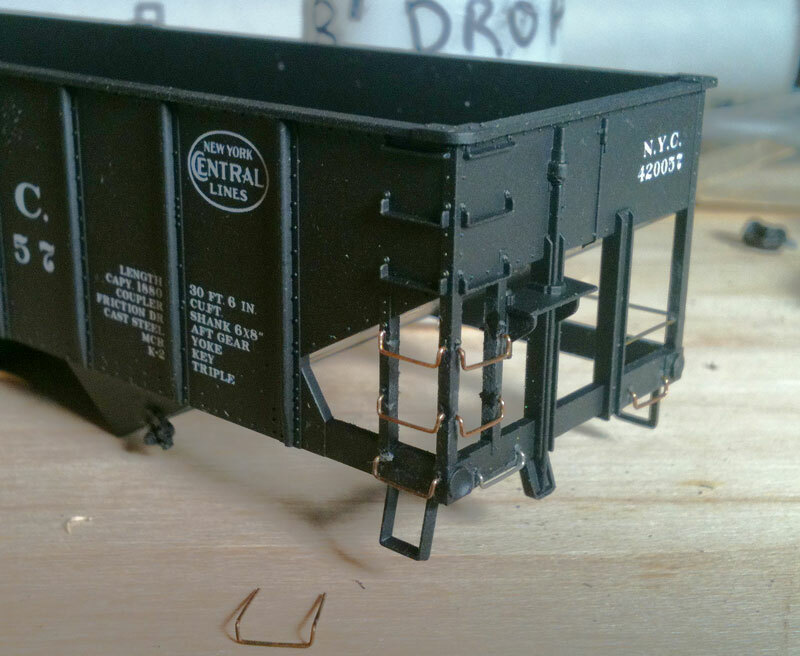 But how can I add this element to the Accurail USRA hopper models, or even the Bowser GLa hopper models? Many years ago I was comparing the Tichy and Accurail cars side by side. That’s when I noticed extra rivets on the cars at the same elevation on three side stakes. On the Tichy car, these were on the other side of the car side wall from where the interior braces were attached. On the Accurail car, the inside walls are blank. A-ha! Then I noticed how these attachment points seemed to be in a similar plane as where the slope sheet intersected with the end. So these were fine discoveries, but what the heck do I do? I dug out some scrap sheet styrene and began playing around. In short time, I created a tool to help place these interior cross-braces. The tool also has a segment that can be used to cut styrene shapes to length. The notches along the bottom are used to pull the cross-brace into place, while the entire tool is the same length as the interior length of the model. It just fits right in to use. I use Evergreen 4×4 styrene material. Today there may be black or gray plastic available in a similar size. That would make painting easier in the touch-up phase. So I cut up enough material for two hoppers and found a problem. The 4×4 fit the center brace fine but were slightly short for the other two. These need to fit snugly, so I cut two more braces slightly longer and filed the ends square. They fit fine with a slight bow. These can be placed by hand and then use the tool to set them into proper place. A touch of MEK or liquid styrene cement seals the deal. I found it easier to do the middle brace first on each car before adding the others. I have used CA or superglue in the past and have found these parts can shear with use. By using the a styrene cement you are welding the part to the car sides. If the braces are too short, or just fit, they may not hold as long as you would like. Hence installing braces with a snug fit is a better bet. Plus the prototype braces get beat up pretty quickly and do not stay straight for long. I made another tool to use on the Bowser GLa hoppers. These are slightly different interior dimensions so you will need to make one for each car design. I touched up the extra detail parts on all four hoppers using Floquil Engine Black. While worlking on this step I realized I forgot to add the uncoupling levers to the two post-WWII hoppers. These will be basic top-pull uncoupling levers easily made from 0.012″ brass wire. The Detail Associates parts represent bottom-pull uncoupling levers. I used some extra lighting to capture images, but I’m still using my iPhone just to see how this works from beginning to end. Here are both hoppers side by side. The Big Four car was a special run produced for the Cincinnati NMRA Division and based upon a late 1940s photograph of a car with this lettering. I think I’ve seen at least one other image of a Big Four hopper from the same era with similar lettering. It adds a little quirk to the fleet. Air hoses will not be installed on the post-WWII cars. Here’s a corner view of one of the 1926 era cars. And here are the brake ends of both cars in a side by side. Sorry if things are a little fuzzy. I don’t think there is a manual focus aspect to my iPhone. These models are complete for the most part, except for a couple of small details. 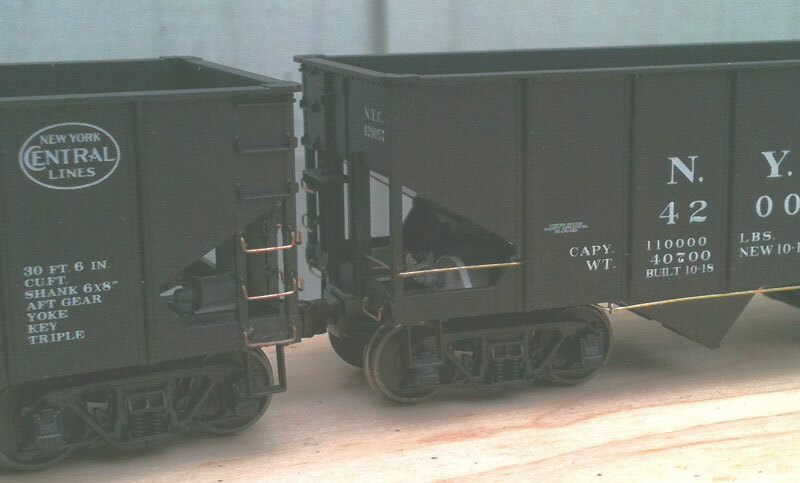 The next step is to add elements of weathering so the hoppers seem like they have traveled thousands of rail miles. Those steps will be covered in another blog post, hopefully in the very near future. Thanks for following along with this model build. Your comments are welcome. All comments are reviewed and approved before they appear below. I wonder if this means that Tichy now has the decal artwork? Great Blog! I really enjoyed reading it, even thought I model Australian (Victorian) railroads. 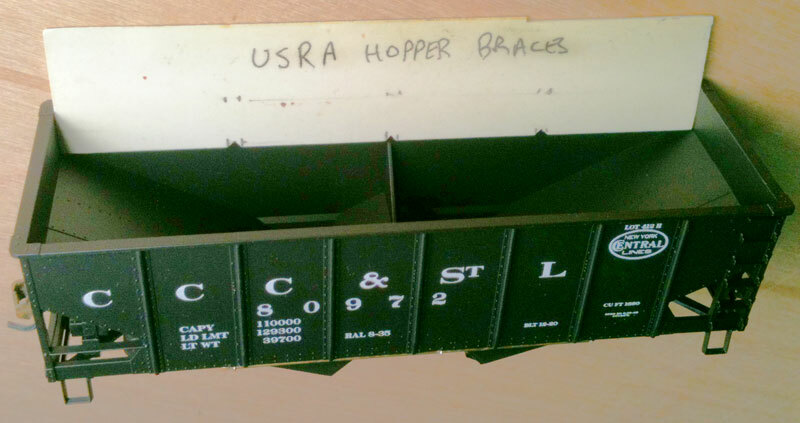 The Erie Lackawanna Historical Society has Deleware Lackawanna & Western decal sets available for the USRA open hopper. I think a good book on all USRA freight cars with scale drawings is due! Great stuff man! I need to re-read this in a few months when I can really dig in on upgrading my own roster. You got social channels in addition to the blog here? Would like to connect.